Our investment projects represent the cutting edge of sustainable development today. They are built on the most promising ideas brought together by our teams, and developed with experienced professionals to ensure success. With our visionary investors we hope to realize significant change through these projects, set an example of sustainable development, and deliver healthy profits to continue innovating. Except's investment platform and holding cover a range of projects targeted at innovative solutions for sustainable development. They include urban development projects, software solutions, spin-off consultancies and development tools. The platform forms concepts, teams, business models and guides the launch of new startups. The objective is to maximize impact combined with increasing returns. We believe in what we do. The Except team invests hours and resources in our own projects to ensure their success. We're committed to them in the long term, using our experience since 1999. We regularly partner with other organizations to set up new ventures. The scale of our investment projects ranges from small projects with a turnaround time of less than half a year to large scale urban developments. We enjoy working with investors that are engaged and passionate about making positive change to the world. We rely on our network of investors to support these projects. Investors looking for innovative sustainable projects and all-round support are welcome to contact us. The running investment projects that are public are listed below. At any time we have new projects under development that are not listed here. Contact us to know more about these and other projects. Polydome is a revolutionary model for sustainable agriculture. It doesn't rely on any ecologically harmful practices or fossil fuels, while being as productive as the most advanced agriculture systems out there. Polydome is succesful as one of our first investment projects, and the model is complete. 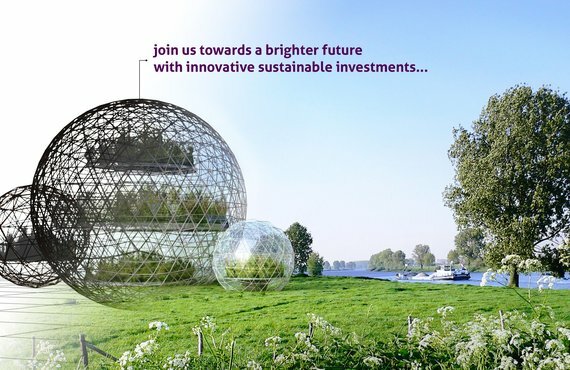 Now, we're looking for visionary investors and partners to develop Polydome pilots, both in urban settings and rural. Read more about the original Polydome project here. Interested in investing in Polydome? Contact us for more details. The International Research Institute for Autonomous Development (IRIAD) is a global knowledge institute focused on locally integrated sustainable development. IRIAD combines scientist, engineers, designers and developers in a world wide knowledge network to support the transition to a brighter future. It physically builds this reality in an inspiring living and working campus where energy, water and food are produced alongside research and education facilities. IRIAD is currently in its planning stage, looking for foundations and capital investors to develop its first facility. Contact us for more information. MaasNet is an online knowledge sharing and management platform focused at improving operations around the Rotterdam harbour and industrial area. Using new discoveries in IT and cooperative frameworks it creates a stronger economic reality, saves resources and estbalishes strong stakholder networks in the area. Participation in the MaasNet project is currently offerted to interested parties in and around Rotterdam. If you are interested in participating, please contact us here. FlowMat is an online software application that enables the development, simulation and monitoring of large scale material and energy cycles, such as urban metabolism, industrial symbiosis and the circular economy. FlowMat is built on Except's decade of experience in systems modeling and analysis. The project is in its development stage, and is currently in search for venture capital, with a return on investment of within 4 years. Elemental World is a book which maps all the essential energy and material resources our world in beautiful maps that deliver new insights in how our world works. The book is a short-cycle development, aimed at making an inspiring coffee-table book and connected resource website. Interested in supporting Elemental world? Contact us for more information. The Utrecht Innovation Community is a collaborative hub for independent entrepreneurs to work together on sustainable solutions in the city of Utrecht. Build on the experience of the Rotterdam Collective, the Utrecht Innovation Community offers 1500-2000 m2 of office and work space for collaboration, education and development in the heart of the city. Existing partners are the City of Utrecht, Utrecht.Inc, Utrecht Investment Agency and Taskforce Innovation. The UIC is currently establishing its building and workspaces, and is looking for partners to develop content and resources. Interested in participating? Contact the UIC's development manager Tom Bosschaert here.